Nesika Illahee, an affordable housing development in Portland's Cully neighborhood, includes units reserved for members of federally recognized tribes. 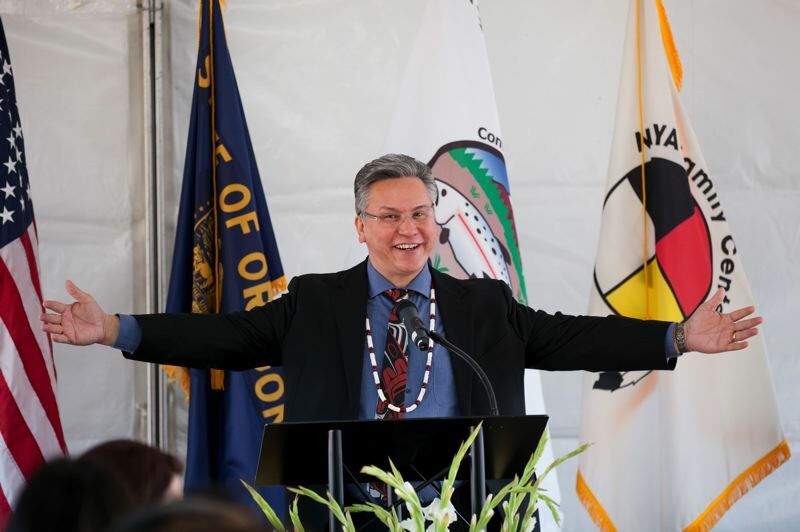 While 59 units may not sound like enough to make much of a dent in the Portland metro area's need for affordable housing, the number represents a milestone for Native American groups attached to a new project ready to rise in Portland's Cully neighborhood. When completed in late 2019, Nesika Illahee's 59 affordable residential units, ranging from studios to three-bedroom apartments, will serve people earning 60 percent or less of the area's median family income. Twenty of the units will be reserved for enrolled members of federally recognized tribes. The groups that have come together to make the development a reality say the project, whose name means "Our Place" in Chinook, is groundbreaking for several reasons. A portion of the money for the project will come from the Confederated Tribes of Siletz Indians in the form of a Native American Housing Block Grant, which is usually limited to the construction of housing within the boundaries of reservations. The project is believed to be the first time that the federal grant money has been used to build housing in an off-reservation location. 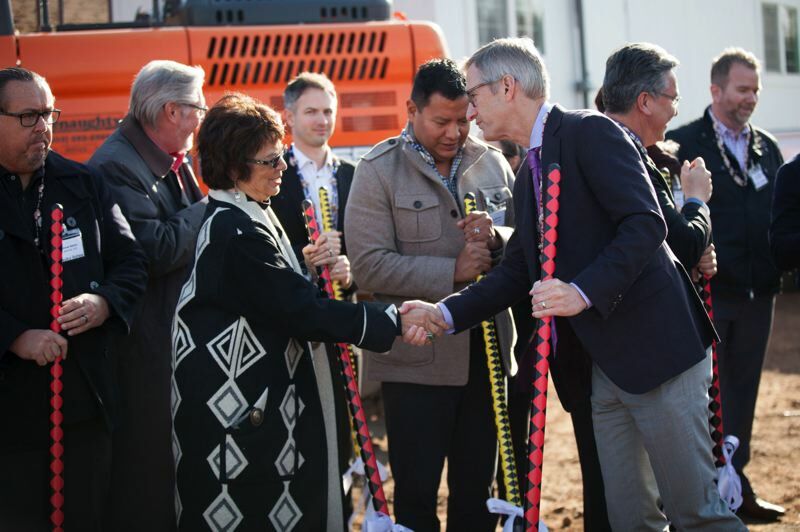 "This is a new and innovative way to use those funds," Portland Mayor Ted Wheeler said during a ground-breaking ceremony held Nov. 20. The project also represents a unique effort between tribal and nontribal partners to join together to build affordable housing. In addition to involvement of the Siletz tribes, Community Development Partners is serving as the project developer. 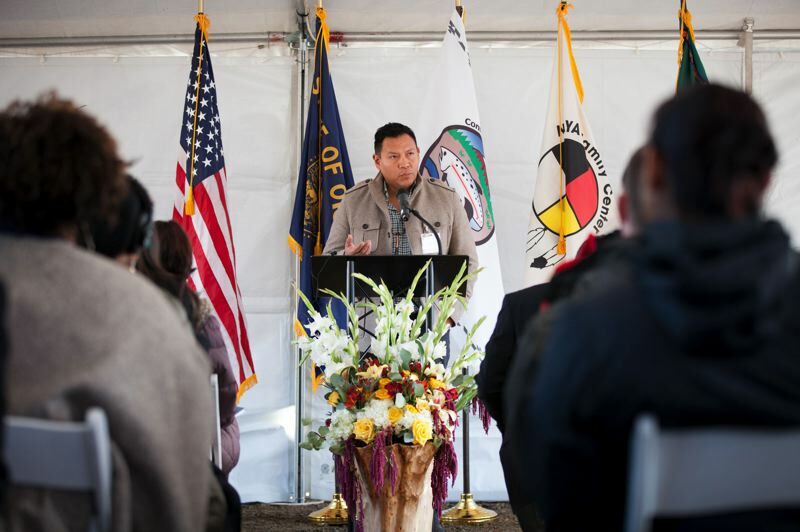 The Native American Youth and Family Center (NAYA) and the Native American Rehabilitation of the Northwest (NARA) also have been involved in moving the project forward. Once it opens and tenants move in, the two nonprofits will provide supportive services. All residents for example, will be able to tap the medical, dental and behavioral health care services that will be offered in-house. Multnomah County Commission Chair Deborah Kafoury sees the project as an opportunity to address what she told those gathered for the groundbreaking has been a "staggering" increase in the number of Native Americans who have been forced out of housing and onto the streets because of rising rents. Native Americans make up 2.5 percent of the county's total population. However, during a 2017 count of the county's homeless, 10 percent of those counted said they identified as Native American, Marc Jolin with the county's Office of Homeless Services said. In addition, the Native American population in the Portland metro area is four times more likely to experience poverty than the white population, according to Kafoury. "That is not acceptable," she said. The 27,852-square-foot site where Nesika Illahee will be built was purchased more than two years ago by Community Development Partners, a Portland-based affordable housing developer, which then brought on Carleton Hart Architecture to help come up with an early concept for the property. But it wasn't until NAYA, NARA and the Siletz tribes agreed to become involved in the project that it took on a more defined shape and form. Carleton Hart had previously served as architect for another NAYA housing project called Generations. For the design for the Nesika Illahee project, the firm's team turned to materials that NAYA identified as important to those with tribal affiliations. The finished building, for example, will feature an abundance of cedar. "It's a material that has a lot of cultural significance," firm principal and co-founder Brian Carleton said. "It takes on a certain ceremonial importance." The three-story, wood-frame building also will contain artwork and landscaping, including plaza layouts and patterning, that will hold special significance for Native American residents, according to Carleton. "Native Americans will notice the culture references that will be welcoming and say this was a place built specifically for [them]," he said. Kyle Anderson, vice president with project contractor LMC Construction, said his team anticipates few major hurdles when it comes to the actual building process. The bigger challenge, at least right now, is for Anderson and his team to make sure they're establishing a strong rapport with the project's neighbors. Because the surrounding area is mainly residential, keeping people informed and minimizing traffic in the area are at the top of LMC's list. For LMC project manager Ken Bello, the project is more than just another job he's handling for his employer. Bello also lives near where Nesika Illahee will be built at the corner of Northeast 42nd and Northeast Holman Street. "This is my neighborhood," Bello said. "I'm proud and honored to be able to be involved in this [project]." Delores Pigsley, chairman of the Siletz tribes, said the project had to battle naysayers in the past who considered it impossible to pull off. But she sees the recent groundbreaking as a turning point, a sign for what can be accomplished in the future to help those who identify as members of tribes, including the more than 300 Siletz members who reside in Multnomah County. "We tried to do this at a lot of different places and had a lot of different difficulties," Pigsley said. "We look at this project ... as a beginning of what we need to do in more areas," she added.